CIPA 32000 Day/Night Mirror Approx. 10"
CIPA 32000 Day/Night Mirror 10"
Day/Night feature for comfortable driving. Fits OEM mounting on most cars, trucks & vans. FMV safety approved. CIPA's line of Day/Night mirrors are the perfect replacement for your factory installed mirror. 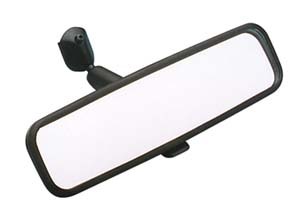 This approximately 10 inch mirror attaches to the windshield on a wedge-mount, and can be tilted to reduce the brightness and glare of headlights shining directly at eye level. The front and rear internal faces of the Day/Night mirror glass are not parallel to one another, allowing a manual tab adjustment to switch between day and night positions. In the day position, the front face is slanted and the reflective back-side provides a strong reflection. When in the night position, its reflective rear face is slanted out of line of the driver’s sight. Since the non-reflective front allows the majority of the light to pass through, only a tiny amount of light is reflected into the driver’s eyes. This means an increase in both safety and comfort at a fraction of dealer costs. Also available in an 8 inch design (part number 31000) and 12 inch design (part number 33000). Fits OEM mounting on most cars, trucks and vans. Mirror mounting adhesive not included. Bracket is included. FMVSS approved. Expand your horizons.